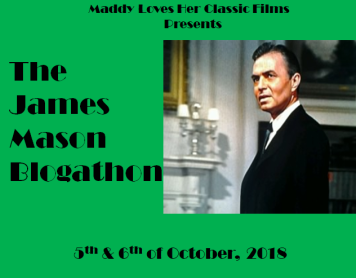 This is the second of 2 posts dedicated to The James Mason Blogathon being held over at Maddy Loves Her Classic Films. Brief Synopsis – A British officer is assigned to command a unit of Australian troops as they must hold off the German advances on the city of Tobruk in 1942. My Take on it – I was really looking forward to seeing this film after enjoying the first film where James Mason played Erwin Rommel; The Desert Fox: The Story of Rommel (1951). Unfortunately, this film is not nearly as enjoyable and isn’t a sequel as it makes it seem like it is. 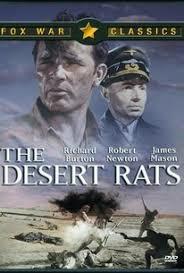 The only connection is the character of Erwin Rommel who is played by James Mason in both films. Unfortunately, due to the backlash of portraying Rommel in too sympathetic a view in the previous film, Mason needed to portray the character in a very different way here in order to make him seem more ominous. The added fact that in this film Mason’s portrayal of Rommel feels like a glorified cameo instead of being a lead or even a supporting character. The overall story of this film could have been done much more interestingly and its too bad that they chose to focus more on aspects that come across as being too stereotypical and there isn’t any uniqueness felt as one would expect from a war movie like this. Bottom Line – Mediocre war film that doesn’t work as well as many other films depicting similar situations. Mason plays Rommel in a strange way which is completely different from how he did it two years earlier and it feels much more like a cameo instead of as a lead or even supporting character. The overall story is interesting, but they focus too much on aspects that feel more stereotypical than unique like one would hope from such a film. I started to watch this once, and although it’s not like me to give up on a movie easily, this was one to which I bid an early farewell.